« Containers — who needs them? It occurred to me today that the world has moved on sufficiently if I can buy 5kg of flour and not have to worry about it being infested with weevils. For starters I’d wonder how in the heck the little blighters got into the apartment, and second we’ll likely keep most of it in a plastic container. The only real hassle will be using it quickly enough. However, as long as we do use it all then the savings on this bag of flour are pretty good. This 5kg cost me $7, when a 1.5kg bag from the same place, Moore Wilsons, would have $3.88. So we save roughly $5 buying in bulk. As I say, this is only an actual saving if you’re going to use the product in good order. But, with this winter being as damn cold as it is, baking seems to be the best way to get decent warm food in us while also heating the place up! I’m planning three primary dishes for this flour. Mini muffins, scones, and, if I can get the yeast to rise, Bread. 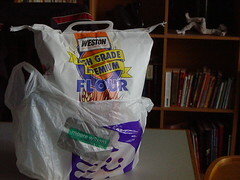 I always buy flour in bulk but we go through it fast. I can usually get it for $6.99 at the local supermarket. If you bake a loaf once or twice a week, you should get through it well before it goes stale. Eg, at 500g per loaf, you could chew through it all (literally) in 10 weeks, just with one loaf per week. Some of the best yeast-raised bread is made by long fermentation at lower temps, so don’t worry about rising. Use less yeast and let it rise overnight, or for a whole day. It’ll be great. If you have freezer space you can store flours, nuts, etc, etc (even milk!) in it. Weevil free and lasts longer too! Just remember to take the flour you need for baking out a day ahead so it has time to get to room temperature.